Rosario: I don’t know any US history. Paco: That’s easy. First they screwed the Indians; then they screwed the slaves; and now they’re screwing the Mexicans. A mother gets up before the sun rises on Los Angeles to take the first of many buses to get to the first of her two housecleaning jobs. Elsewhere, in Mexico, her nine-year-old son still sleeps soundly in his bed. Before she left him over four years prior, she told him that should he ever find himself lonely and missing her, that he need only look up to moon in the sky and know that she too would be looking and thinking of him. In that thought, both the title and the dualistic tone are set for a surprisingly poignant piece about the borders that keep both countries and people apart. Director Patricia Riggen’s UNDER THE SAME MOON is a brave film that proudly puts a face to an issue that has polarized America. While the main focus surrounds precocious Carlito (Adrian Alonso) as he crosses the US/Mexican border to find his mother after a family death leaves him alone, his journey draws attention to the plight of a people who want only to pursue a better future for their families. It is soft and sweet one moment, difficult and tense the next, but always subtle and sensitive. 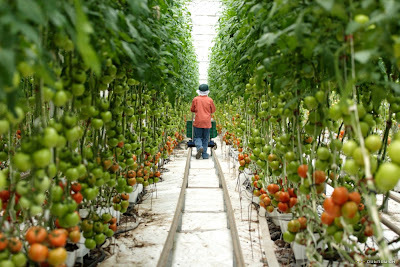 Its significance is found in its simplicity – while our heart strings are being tugged, our eyes are also being opened. 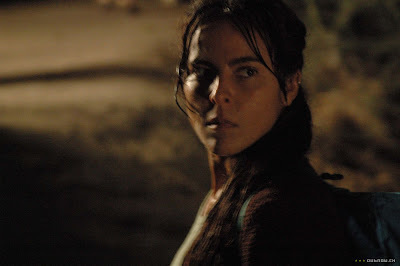 When Rosario (Kate del Castillo) stares up at the moon, the longing to be with her son is matched only in magnitude by the constant wondering if all of her sacrifice is worth the trouble. The contradictory nature of her existence is a heavy burden to bear. She demeans herself daily cleaning the house of a wealthy woman who treats her like a second class citizen and then has to clean another house and sew dresses nightly in order to put any money aside. As every hour of every day disappears without notice or meaning, years go by without seeing her son. She must work so hard in order to provide him with the possibility of a brighter future and this sacrifice is truly great. For as she slaves away the days, sure to always be on the lookout for the Immigration and Naturalization Service, her son is growing up without her. She has foregone the potential of her own happiness and cut herself off from the one remaining source of joy in her life. The decision she made years ago to cross the border has now drawn another line between mother and son that she knows may one day be too thick to be erased. When Carlito stares up at the moon, the longing to be with his mother is matched only in magnitude by the bewilderment derived from feeling abandoned. He cannot reconcile his mother’s love still felt in his heart and the reality of their situation. Four years after she left, his faith is finally faltering. While Rosario’s daily renunciation is a testament to conviction and hope, Carlito’s mission to make his way from Mexico to L.A. gives the film a heartbreaking tenderness while still tersely telling the truth of his tale. A boy willing to go to such great lengths just to be with his mother may sound saccharine in nature but there is nothing sweet about a nine-year old hitchhiking in Tucson, working wherever he can to pay for bus fare or nearly being sold into child prostitution. Ligiah Villalobos’s lean screenplay never loses sight of the prize long enough to find itself off course but it is also never afraid to talk about the reality illegal immigrants must face on the streets of a supposedly great country. The dichotomy between sappy and serious is what makes UNDER THE SAME MOON so effective. While we want with great desperation to see mother and son reunite, we are also exposed to the reality imposed by our own ignorance upon such innocent hopefuls. Once upon a time, America used to be the land of the free. People the world over would immigrate in pursuit of the elusive American dream. Things are very different now. Now there is the threat of terrorism, economic unrest and generally widespread panic and fear. To be foreign is to be frightening. All of our misconceptions dehumanize those involved and in a backwards fashion, somehow glamorize the experience. 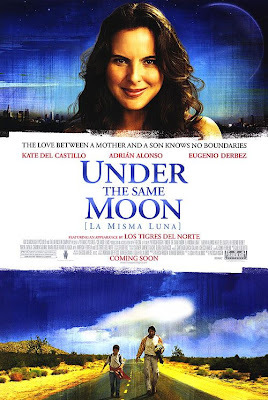 UNDER THE SAME MOON is a fine, refreshing film that gives a voice to those who are so seldom heard in a fashion that will allow it be heard by many. And for all the tears and warmth it brings to the viewer, perhaps its crowning achievement is that all who see it will inevitably find themselves staring up at the night sky shortly afterward, realizing that we all live under that very same moon no matter how many lines are drawn between us.